If your aging mom or dad is spending a lot of time just sitting around, or they are dealing with illness or injury that limits their mobility, consider getting them involved in an exercise plan. Numerous studies show the benefits of exercise, even for short amounts of time several times per week. Elderly people can especially benefit from the physical and mental boost that exercise brings to the body and mind. Here are some tips on how you can help your elderly parent get more exercise, even if they are dealing with a condition that limits their mobility. Talk to their doctor before starting any kind of exercise and get some ideas of what kind is appropriate. 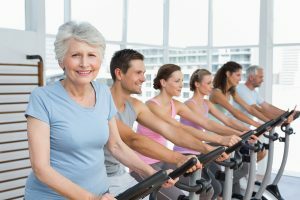 Explore different types of senior-friendly exercise, like a stationary bike, chair aerobics, swimming, walking, yoga, and weights. Keep it fun and interesting by adding music, conversation, podcasts or TV shows if possible. and visuals if possible. Dress them in appropriate workout clothing that includes sturdy, non-slip shoes. They also need to wear lightweight and comfortable clothes that won’t restrict their movement. Participate in light warm-up stretches so your aging parent will avoid sore muscles and possible injuries when exercising. Start out slowly and increase their level of activity so they can get used to the routine and build up their stamina. Let the aging parent set the pace at first, no matter what the activity. From walking and weights to tai chi or chair aerobics, seniors need to be able to handle the basics before moving up. Ask them to drink plenty of water so their body stays hydrated while they exercise. Set realistic exercise goals and work together to accomplish them. Help them set fitness goals and manage expectations. If they miss one or two days for a good reason, they should not worry but instead just get back to it the next day. Watch for warning signs of negative health, like dizziness, shortness of breath, nausea, or chest pain. Incorporate exercise into the daily schedule so that it’s easy for you and your aging parent to stick to it. One of the best ways to ensure an aging parent makes time to do the exercises they desire is to hire a home care provider. This professional assistant works with aging adults in their own home. They help seniors with all kinds of tasks, from housekeeping and laundry to meal preparation and medication management. They also provide companionship and can take elderly adults on outings. It’s just part of their duties to help seniors be active and get some exercise in. Incorporating an exercise plan is one of the best things a senior can do for their health. With support from family caregivers and home care providers, even the least mobile seniors can do it. IF YOU OR AN AGING LOVED ONE ARE CONSIDERING HOME CARE SERVICES IN MANALAPAN TOWNSHIP, NJ, PLEASE CONTACT THE CARING STAFF AT LARES HOME CARE 888-492-3538 OR 732-566-1112.